Gary Anderson, Director of Civilian Marksmanship (DCM), has authored an excellent primer on the use of plug gauges to score targets. Anderson reviews the different types and sizes of gauges and explains the sometimes confusing rules for there use. CLICK HERE to read the whole article in the First Shot, the CMP Online Magazine. Anderson writes: “A frequently asked question at CMP concerns what are the correct gauges to use for scoring different targets and where can they be obtained. This is not a simple question to answer. There are inward gauges and outward gauges for most 10 meter and 50 foot targets and when each must be used varies from target to target. There are actually three different smallbore or .22 caliber inward gauges. And in High Power rifle matches governed by NRA Rules, the gauge used depends upon the caliber of the rifle being fired at each target. Moreover, ISSF and USA Shooting Rules give legal gauge dimensions in millimeters and NRA Rules use inches, while National Three-Position Air Rifle Council gives both. With so many rulebook variations, it is not difficult to understand why questions about scoring gauges are commonplace. A scoring gauge is a precision metal instrument with a spindle sized to fit into the shot hole and a flange or “measuring diameter” turned to a precise size that is specified in a competition rulebook. The gauge, which is often called a “plug,” is inserted into a doubtful shot hole. The scorer then examines or “reads” the edge of the flange to determine whether the doubtful shot is “in” (receives the higher value) or “out” (receives the lower value). 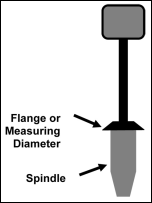 A magnifying glass is usually used to aid the scorer in accurately reading where the edge of the flange lies. Scoring gauges come with various types of handles that are used to gently hold the gauge while inserting it in a doubtful shot hole. 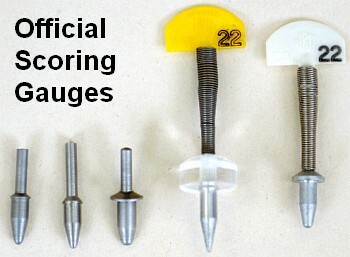 Scoring gauges available in the USA vary in cost from $4.00 to $15.00. A first step in sorting out this question requires an understanding of the difference between inward and outward gauges. 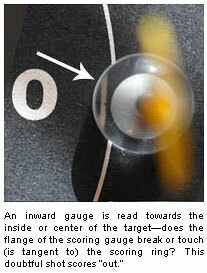 An inward gauge is read on the inside or side of the gauge that is closest to the target center. An outward gauge is read on the outside or side of the gauge that is away from the target center. Anderson’s full article goes on to list the specific gauges (with dimensions) used for a variety of disciplines: 5-meter BB gun, 10-meter Air Rifle, 10-Meter Air Pistol, 50-Foot USAS 50 Smallbore Rifle, 50-Foot A-36 Smallbore Rifle, ISSF/USAS .22 Cal. Rifle & Pistol, NRA Smallbore Rifle & Pistol, CMP Rimfire Sporter (and Sporter rifle), CMP Games High Power Rifle, and CMP EIC and NRA Highpower Rifle. Anderson notes that NRA Smallbore Rifle and Pistol targets, as well as CMP Rimfire Sporter targets, must be scored with a .22 NRA Inward Gauge (.2225-.224”) for all rings. 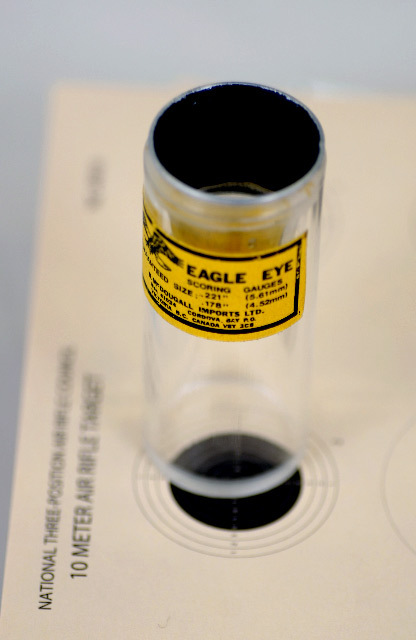 Anderson suggests using an Eagle Eye scoring device to detect and score double or multiple shot holes. CLICK HERE for FULL ARTICLE with GAUGE SOURCES. Text and photos © 2008 CMP, used with permission.